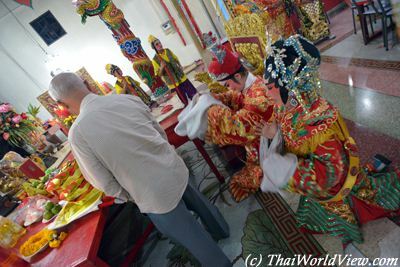 Yearly Chinese deity festivals are important events for the local Chinese communities in Bangkok or provincial villages. This troupe is the famous modern Chinese opera troupe Sai Yong Hong (คณะไซ้ย่งฮง). 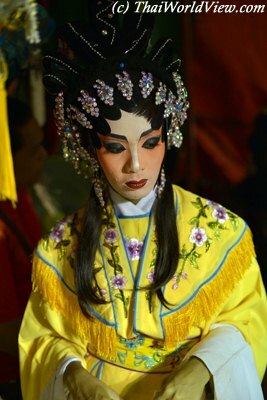 Chinese opera troupe Sai Yong Hong has even a facebook page. 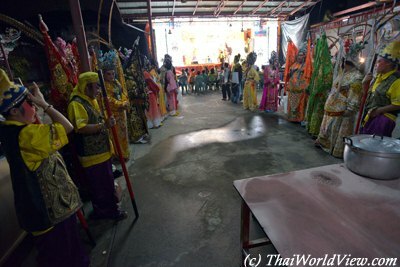 The celebration performed on that day is called เทศกาลไท้จื่อเอี๊ยแซ. 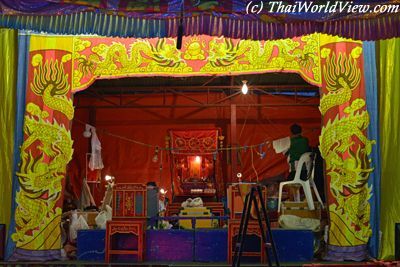 Pictures on this page were taken at a Chinese Shrine located on On-nut Soi 8, Bangkok (อ่อนนุชซอย 8). This event took place from 24 May 2015 to 26 May 2015. 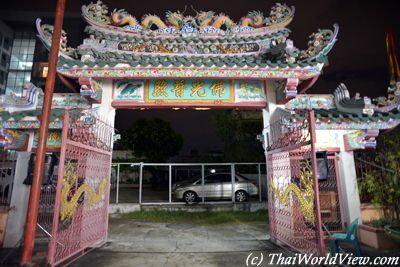 The event is happening in a neighbourhood located in the small Chinese shrine located on On-nut Soi 8, Bangkok. 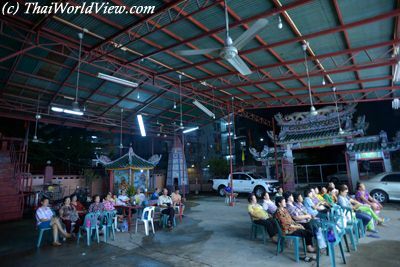 It is deep inside the Soi 8 so there is no restaurant around the Chinese shrine. 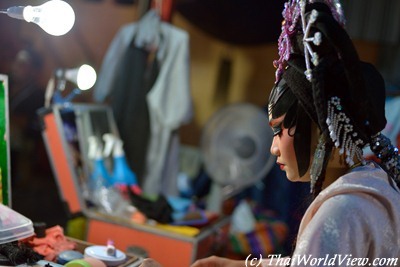 Starting 7PM, local performers start to apply make-up and wear Teochew opera costumes. This is not a big Chinese shrine so the audience is quite limited. 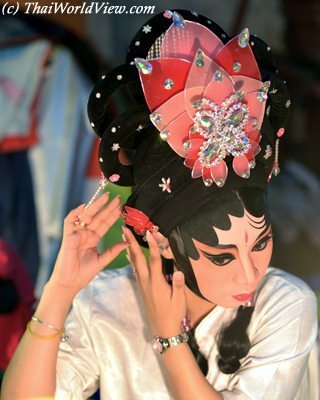 Nowadays Chinese opera companies sometimes do play not in front of live audiences but for invisible deities! Whatever a big or limited audience, Chinese opera performers always put the same effort to have neat make up and beautiful costumes. 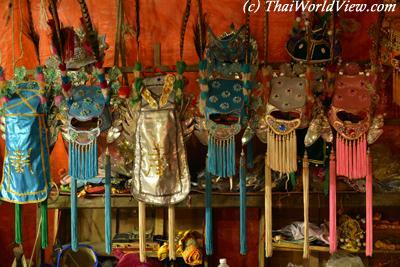 In the backstage, various hats used by the Chinese Opera performers are ready to be worn. 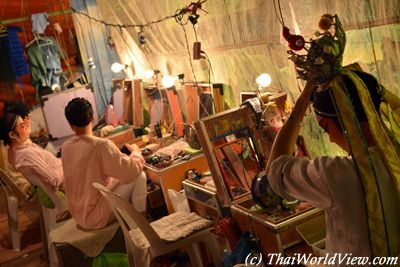 Before the start of the official opera performance, local actors and actresses are very busy finalizing their make up. 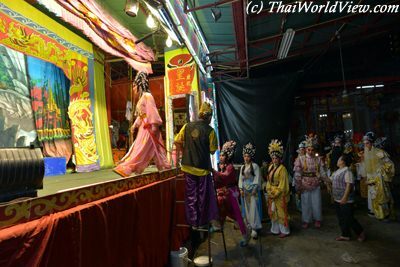 Sometimes the troupe can perform in a small Chinese shrine in back alley or a wealthy Chinese shrine with many supporters. 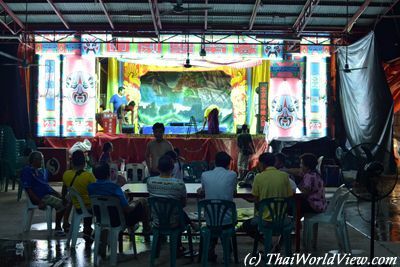 There are still around 30 Chinese opera troupes in Thailand. 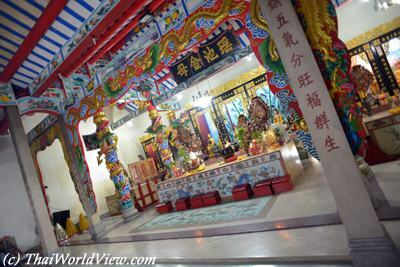 Chinese shrines are always very colorful. 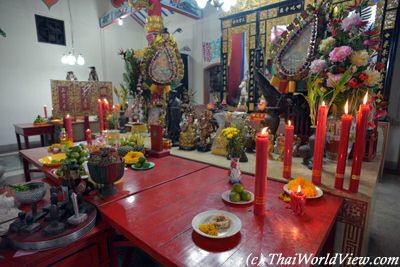 A complex set up is redy to pay respect to the local deity. At every performance, the troupe pays homage to the spirits of the local Chinese shrine. 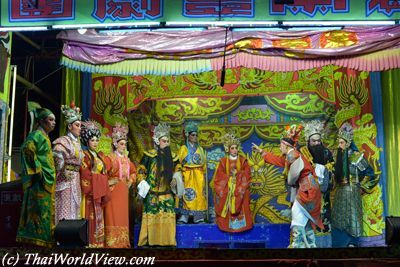 Some local important Chinese opera troupe can be up to a 30-person troupe. 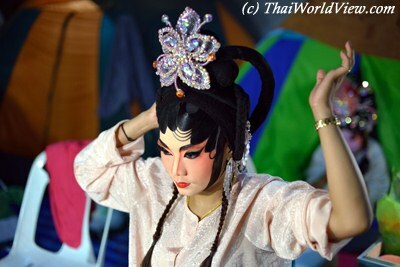 Performers are from Isan region (northeast of Thailand), China and local Thai people with Chinese ancestors. Today it is a disappointing limited audience but it doesn't matter as the troupe isn't playing for the audience. They are playing for the gods! The real story starts around 8PM30. Before there is a six warriors prelude featuring a lot of fighting. This small Chinese shrine in back alley features a really impressive door. After the prelude, the whole Chinese opera troupe is leaving the scene to enter the shrine. 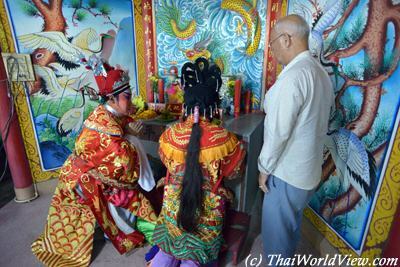 Then they pay homage and respect to the spirits of the local Chinese shrine. Two performers in red clothes, a man and a woman, are the key representives greeting the gods. Once this homage ceremony is over, they go back to the Chinese Opera theater. 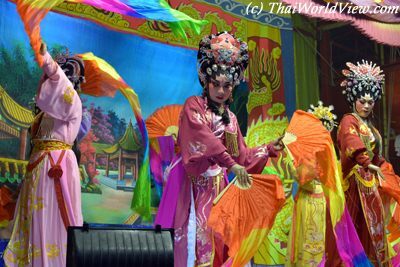 The Chinese Opera performance is very lively with multiple dances featuring colorful fans and silk scarves. 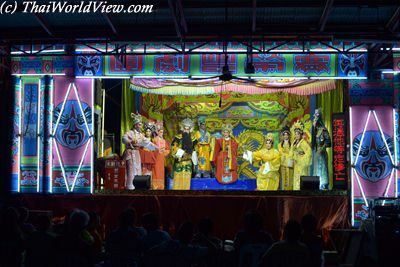 Sai Yong Hong, Teochew Opera Troupe, was created in year 2008. 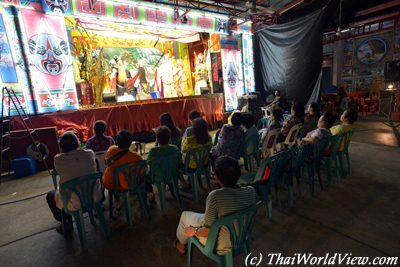 The theater scene is not very big but up to 10 people can perform at the same time. 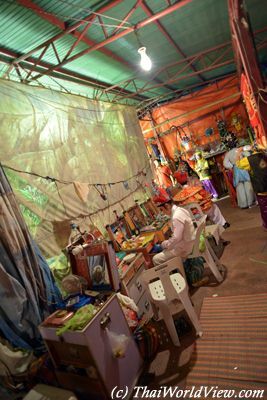 Each Deity festival lasts a few days so the Chinese troupe opera will move soon to another place.